Home is where you seek solace at the end of a strenuous and stressful day. It’s the place where you live and laugh, cook and eat, stay and drink, celebrate and crib, smoke and breathe, and do what not. It is basically the comfort zone that is equipped with all the necessities so that you don’t have to step out. People spend almost 80-90% of their life staying in the enclosed environment, be it their workplace or residence. They tend to avoid remaining outdoors as much as they can because air pollution levels are so high outside. Ambient air is, indubitably, hazardous for you to breathe and the AQI levels are much above than what is considered to be safe. But if you have mistaken yourself to believe that you’re safe inside your well-constructed and decently convenient abode, then think again. 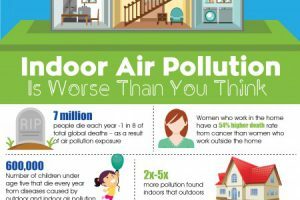 The studies conducted by the United States Environmental Protection Agency have revealed that indoor air pollutants are generally 2 to 5 times higher than outdoor air pollutants. In fact, it has been found that 1.3 million deaths in India every year are caused due to indoor air pollution. 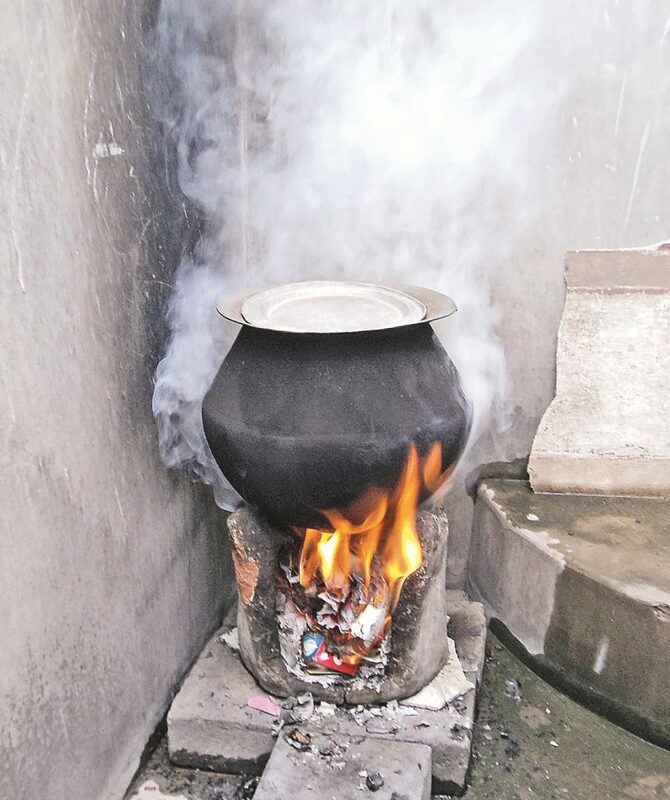 Various findings have established that the air quality in Indian households, particularly in the rural areas, is lethal due to use of wood or cow dung as cooking fuel accompanied with poor ventilation. Clean homes do not necessarily mean green homes. What you are not able to see from your bare eyes are the pollutants hovering in the indoor air in spite of you keeping your place squeaky clean with no traces of grime and dust. 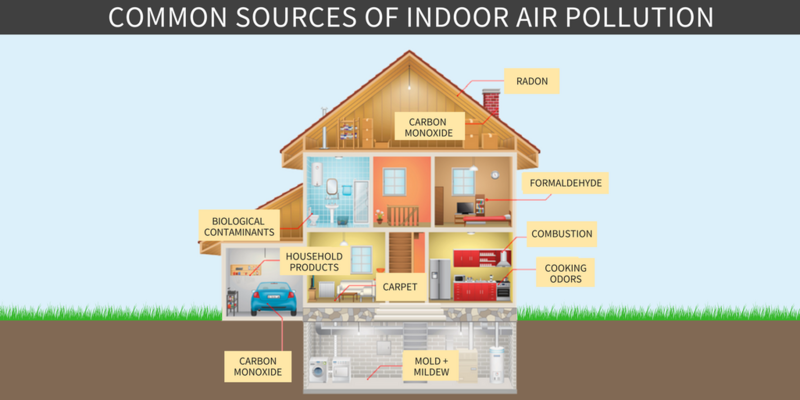 Carbon Monoxide, Radon, Nitrogen Dioxide, Tobacco Smoke, Lead Particles, Asbestos, Mold, Volatile Organic Compounds, Formaldehyde, to name few, are some of the common indoor air pollutants. Fuels used for cooking, cleaning chemicals and paints, hairs and dried skins shed by pets, smoking cigarettes and tobacco indoors, room fresheners, deodorizers and synthetic fragrances, dry-cleaned clothes, biological pollutants, carpets, furniture and upholstery, fumes from paraffin wax candles, and unvented or poorly vented fuel-burning appliances such as, fireplace, heater, wood or gas stove, dryer, water heater are the sources which create pollutants that contribute towards indoor air pollution. 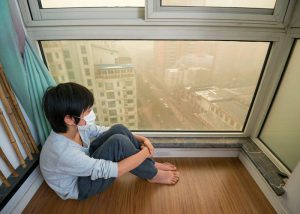 Household air pollution is responsible for causing non-communicable diseases, incorporating Pneumonia, Stroke, Coronary Artery Disease (CAD), Chronic Obstructive Pulmonary Disease (COPD) and Lung Cancer. Impaired Immune System, Cataract, Tuberculosis, Asthma, Nasopharyngeal and Laryngeal Cancers are other health hazards which you can succumb to due to bad indoor air. 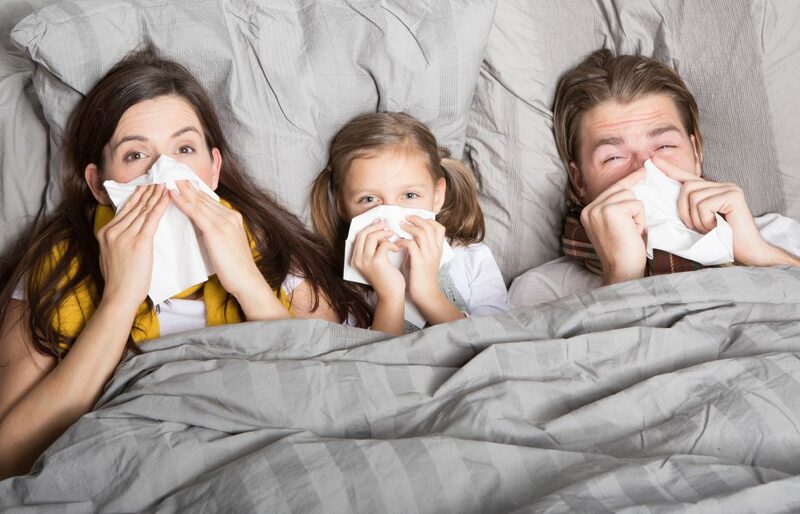 It’s crucially important for people to begin paying heed to indoor air pollution as its health implications are massively disastrous and until and unless we recognize the existence of a problem, a solution can’t be found.